When an engaged couple calls off the wedding, it is usually a time of sadness and anger. But one family in Atlanta found a way to turn a terrible situation into a beautiful one. Carol and Willie Fowler's daughter Tamara was set to get married at the Villa Christina catering hall, when the wedding was called off just 40 days before the event. Initially the Fowlers were upset to hear that the lavish gathering they had planned and paid for was not going to happen. 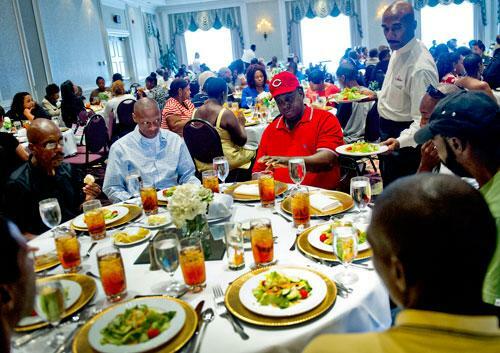 Then they had a genius and generous idea: They invited 200 of the city's homeless to feast on the four-course meal that would have been part of Tamara's wedding reception. The Fowler family called Elizabeth Omilami from the Hosea Feed the Hungry organization for her help in getting the group together. At first Omilami thought she was being pranked! Carol Fowler said that even daughter Tamara attended the event, adding, "She was also very delighted to see and know that others had an opportunity to enjoy something, rather than just allow it to go to waste." Children make up about 70 percent of Atlanta's homeless, so to make the dinner more fun for them, a clown was hired for their entertainment. The event was titled "The First Annual Fowler Family Celebration of Love," and the family says it plans on hosting another charity dinner next year. It's a great example of how you can turn any bad situation into a positive one.